The easy to use KBF-6000 VFFS machine. 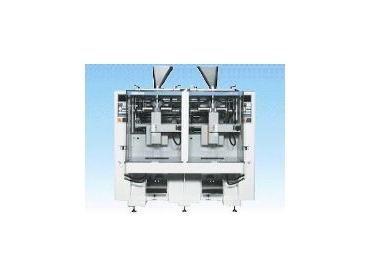 THE KBF-6000 Series two lane vertical form fill seal machine is suitable for every type of food including snack foods, confectionary, frozen foods and fresh foods. Available from Heat and Control Pty Ltd , the KBF-6000 Series is fitted with servo-motor technology on the film feed draw down belt and end seal jaws, resulting in a smooth operation, reliable strength in package seals and higher speed. The machine features user-friendly 9" C.R.T. display and easy to use 50 product data programmable 16-bit microprocessor control, self diagnostics and all the operation parameter settings combined with multi-head weighers. The KBF-6000 Series has more accurate motion and is more precisely controlled. Maintenance information is available for easy operation and quick, simple bag size parts are changeable without tools. Designed to save space, the KBF-6000 Series has a compact profile design. To provide durability, the base frame and mid frame are made of iron casting. Displays include: varied timing, product name, production volume, hour run meter, film length and speed etc. A selection of machines are available in the reliable KBF-6000 Series.